The CCA automatic core cutter is part of a range of converting equipment produced by Universal Converting Equipment. The CCA machine is designed to be a cost effective unit requiring the minimum of operator intervention. The touch screen interface allows the operator to programme their required core lengths. The touch screen interface allows cores of different lengths to be programmed in each cut sequence to optimise the usage of the parent cores. The operator introduces the parent core to the machine and it is gripped by a pneumatically actuated mechanical gripper. The core is drawn into the machine and the length of the core is measured automatically before the cutting sequence begins. The servo positioning system advances the core under the knife. If selected an initial trim is taken to clean up the edge of the core, then the required core lengths are produced. All operations are PLC controlled to ensure precise and clean cuts. The option for variable core lengths is built into the CCA machine as standard. Up to 7 different lengths can be programmed to be cut. 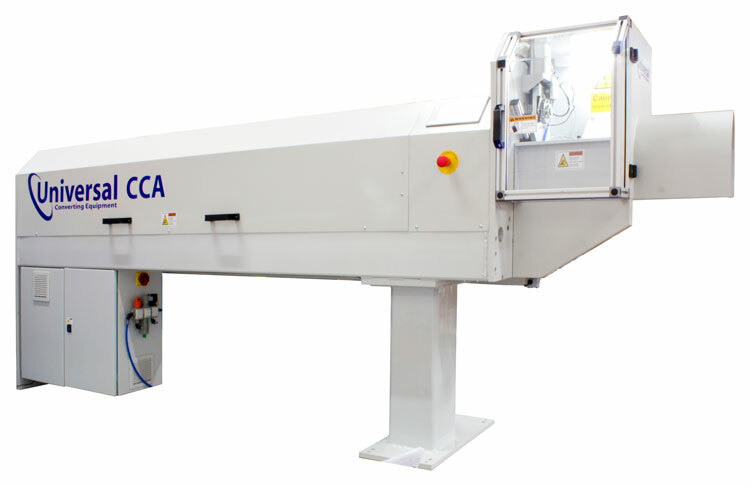 The CCA cutting system employs a pneumatically loaded knife. A high powered pneumatic cylinder ensures that the knife will cut through the hardest of core materials, once the core is cut the blade automatically retracts. This increases the life of the cutting blade and the inner mandrel. The cut pressure is set on the touch screen and does rely on the operator changing a manual regulator. The machine can be supplied with a variety of core gripping chucks to suit several ID cores, the speed of rotation is automatically set to keep the optimum surface speed to obtain a clean cut.